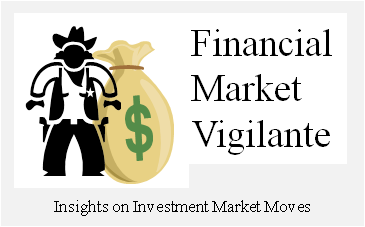 How Worried Should You Be about Your Investments Now? Climbing the ‘Wall of Worry’ is a not so favorite pass-time of most investors. Currently there is plenty to worry about. Deutsche Bank could spark an international financial crisis. Middle East wars in Syria and Yemen could cause disruption in energy supplies. Central Banks, including the Fed, can change course on monetary easing policies, pushing up interest rates sparking investors to sell over-leveraged assets. Ultimately such factors could combine to push the U.S. into recession, which post the 2016 Presidential election would not be an unusual occurrence. Is it a random market event that so many U.S. market downturns coincide with major elections? And I don’t just refer to the years 2000 and 2008. Look at 1972, 1980 or even 1946, to name a few. The passing of the baton to a new party or President almost never happens without some market turmoil. A technical model that I use to gauge the risk of a major market down-turn currently is not showing signs of an imminent market breakdown. 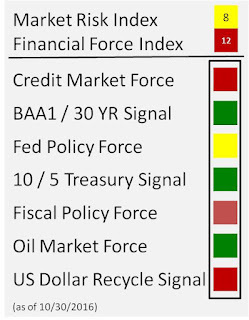 Although there are several risks highlighted by the model, overall the market currently reflects only subdued risk. The model as of September 30, 2016 had a reading of 4 on a scale of 20. 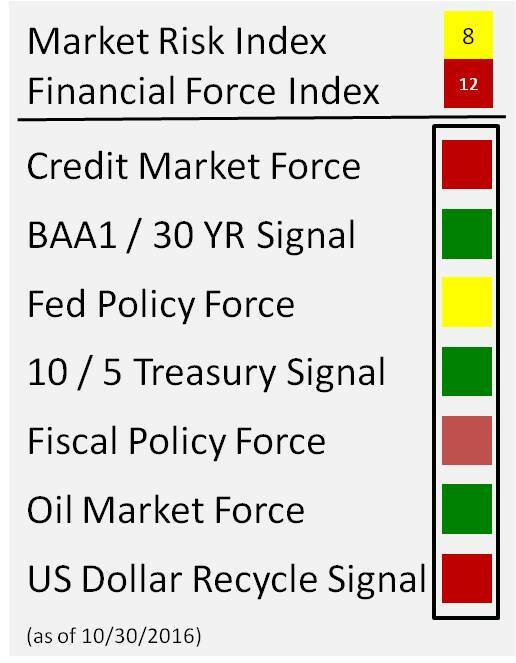 The low reading based on the factors assessed historically dating back to 1956 (month end data-points) put the market in low risk until, of course, something happens. In this model, the usual signal is a year over year collapse in returns to investors. The big moves downward have typically occurred after a quick spike in the market to a new all-time high, followed within 2-3 months by a down move that puts year-over-year returns in negative territory. This signature market phenomenon is explained in detail in my book, Theory of Financial Relativity. I was reading an article published on the CNBC website on October 5, 2016 entitled, This plan brings $2.5 trillion in corporate cash home, and creates jobs. I was struck by how the economic issue which underlies the argument for this plan may be the single most important issue for several generations. If left unaddressed by the next elected President, the U.S. will continue to left on a path of perpetual decline. On the surface, the plan explained in the article nails a good U.S. tax policy response which can potentially unravel the mess we are currently in as a country. But, the cash being hoarded overseas by multi-national companies has a couple of more elements than just the tax rate in the U.S. for corporations. Elements which oddly may not be remedied by a tax code change alone. The economic issue the U.S. faces is structural, and caused by trade agreements which place the U.S. in the position of exporting jobs for the purpose of importing investment dollars for the U.S. debt. Not a good trade for average American workers who deserve to be able to make a living, but an excellent way for crafty U.S. politicians to try to rule the world. The historical data clearly show this issue began to manifest itself in uncontrollable fashion post the signing of NAFTA, a hallmark Clinton agreement. Little wonder that the Clinton Foundation is so beloved by so many foreign governments and billionaires such a George Soros and media moguls with International, not American best interest in mind. Many of these "VIPs" can be found to have been given special access to the Clinton State Department as a part of this appeasement foreign policy strategy; not to mention that the Clinton's have scampered off with over a $100M in the process over the past 4 years through the Clinton Foundation, speaking fees, etc..
A change in tax policy may unravel the mess, but could create, at least in the short-term, nothing more than a run on the U.S. debt as the $2.5T in overseas dollar based cash, currently parked primarily in U.S. Treasuries, is sold to take advantage of a tax break windfall. The reason I am skeptical is because the tax policy did not create the problem in the first place, the trade agreements did. Changing the tax policy only changes the financial flow of capital. Without a solid basis for investment in a U.S. economy which would remain severely disadvantaged by poorly structured trade agreements, the end result would very likely not provide the intended result. I look for a Clinton Presidency, just like the Obama administration, to stand in the way of any move to unleash these overseas dollars. The basis for the Clinton campaign dollar largess is heavily indebted to those with an interest in the perpetuation of the fleecing of the average American citizen, and pushing the U.S. even more into debt. And, these campaign contributions want pay-back in the form of jobs for foreign, not American workers. In addition, don’t look for any of these foreign interests to pay a dime of the multi-trillion dollar tax increases proposed in the Clinton economic plan. My book, Theory of Financial Relativity, published in 2013, provides in-depth research in how and when the U.S. debt expansion became a serious threat to the growth and prosperity of the U.S. economy, and ultimately the wealth manifested in the value of the U.S. stock market. Please consider reading the book if you want to understand why the tax and trade issue, in my opinion, is the single most important issue facing America in the upcoming election. According to an article published by the Cable, Puerto Rico is nearing the Brink of Bankruptcy, the Puerto Rico commonwealth has $72B in debt, some of which it claims it can no longer service, and therefore will default as early as May 2, 2016. The Island government is asking creditors to forgive up to 45% of the principal on certain loans so that it can recover financially. The U.S. Congress is now intervening in the crisis with legislation being reviewed which would give added power to the Puerto Rico government to restructure its debts to the detriment of existing creditors. The public airwaves are currently buzzing with “tell Congress no bail-out for Puerto Rico” ads. Although a 45% haircut to lenders this large is unlikely, many of the Puerto Rico Financial Development Authority General Obligation bonds are trading for $0.20 on the dollar out of fear about what the outcome will eventually be in the current crisis. Just why is Puerto Rico in so much financial trouble? There is a combination of factors which have led up to the current circumstances in which the current government is very likely to run out of cash. First, the country never really recovered from the 2008 recession. Unemployment on the island is remains high at 11.6%, and the labor participation rate is less than 40%. In other words, Puerto Rico’s 1.1M labor force is not big enough or growing fast enough to service the loans. Adding insult to injury, the island population base is shrinking at a rate of -0.6% per year. Why has the Puerto Rico economy been shrinking? One of the major culprits has been the expiration of a federal IRS statue section 936. The section established tax exemption for U.S. corporations that settled in Puerto Rico, such as large pharmaceutical firms, to allow its subsidiaries operating on the island to send money to the parent company federal income tax free. The island economy has been in persistent decline since this statute was repealed by the Clinton administration in 1996. As the manufacturing jobs have vacated the island, new job creating industries have not been forthcoming. The ability of the island to generate cash for loan servicing is indeed dire, but the island government is not a total victim in this situation. There are major inefficiency problems in collecting the Puerto Rico Sales and Use Tax, with estimates showing the Treasury is incapable of collecting up to 44% of the tax. Additionally, public salaries are much higher than the private sector on the island. Per capita income on the island is $28,850, and public workers generally are paid more than average with legislative advisors for instance making $74,000. The island economy could also be much more resilient if public policy took better advantage of its natural resources, and depended less on imported goods. Puerto Rico imports 85% of its food even though 94% of its land is fertile. The islands geography has many rivers which could be used for hydroelectric power, and yet the island must import all its fuel (coal, natural gas, oil) in order to produce energy. Renewable energy sources are also heavily under-utilized even though Puerto Ricans enjoy 65% sunshine on average every day, and wind rates average 22 mph. From an energy standpoint, island residents pay $0.26 per kilowatt hour for electricity compared to $0.11 per kwh in the U.S.
Puerto Rico needs a long-term plan, not a Washington bail-out. Creditors are very likely more than willing to work with the island government if it truly wants to address the structural issues which are making its financial situation worse by the day. However, the role of Washington in this situation should be minimal. The island doesn’t need major loan haircuts which destroy the capital investment process, it needs a long-term economic plan and new direction, neither of which is being put forward currently. If Washington intervenes as desired by the Puerto Rico government, then who will be next in line – Illinois?